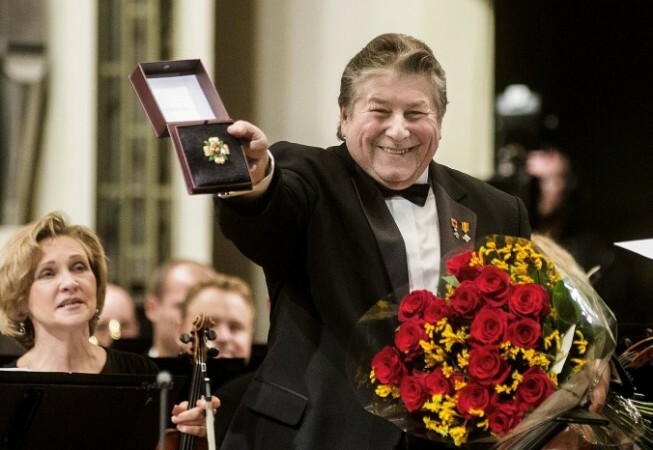 The Good Will Foundation along with the Lithuanian Composers’ Union and the National Philharmonic Society is glad to have been able to invite everyone to a concert dedicated to the 70th birthday anniversary of one of the most famous Lithuanian Jewish composers – Anatolij Shenderov. The Good Will Foundation is very happy to have financially contributed to this event. As per the press release of the National Philharmonic Society, Anatolijus Šenderovas. Concerto fiesta, held on occasion of the composer’s 70th anniversary, will be a true feast for music connoisseurs. His music is often performed in Lithuania and abroad; concerts of his works were held in London, Berlin, New York and Tel Aviv. For tonight’s concert the composer chose concert music. The programme features his most significant works of this genre: Concerto in Do for cello and symphony orchestra, …ad Astra, concerto for bayan and symphony orchestra, Paratum cor meum, concerto for cello, choir, four keyboards and symphony orchestra and a symphonic opus Dance. The gala concert will open with Concerto in Do dedicated to David Geringas. The work was premiered on August 11th, 2002 in the Berliner Konzerthaus and garnered the European Composer Prize. “The ecstatic reaction of the audience was remarkable, the performers and the composer were called back on stage six times. It is hard to remember an occasion when an audience gave a performance of a piece of contemporary music such a spontaneously enthusiastic welcome”, wrote International Art Manager. Later the Concerto earned great acclaim in Manchester (BBC Symphony Orchestra, UK), Kobe (Japan), Adelaide (Australia), Wroclaw (Poland), etc. “Anatolijus Šenderovas’ Concerto for bayan and orchestra made a breath-taking impression. Barely perceived contrasts, dynamic dialogues between the soloist and orchestra. The Netherlands Symphony Orchestra and soloist virtuoso Geir Draugscoll should be credited for this splendid premiere”, wrote the press after the first performance of the concerto …ad Astra, dedicated to the aforementioned bayan soloist. The opus was recently performed in Bosnia and tonight will receive premiere in Vilnius. The concert will close with the premiere of Dance (2015) for symphony orchestra summarizing both the entire output of the composer and the concert programme. Rephrasing the composer Antanas Rekašius, it is the auto-collage of Šenderovas. The musical material is based on the motives of the fast movement from the prodigiously popular David’s Song. Insightful listener can also detect the sonorities reminiscent of the final episode from the Third Concerto for cello and orchestra. All of the above fuses into a furious dance.